I’m telling you, the rush of a surprising a loved one with excellent food (aka a stealth food mission) exceeds the joy of holiday gift-giving by far. Christmas is Christmas, but boxes of cookies with playful notes can strike at any time! Leaving a special treat for your special someone when they least expect it or showing up with a gift and a smile after an unbearable lab period is an unmatchable type of day-brightening. The more detailed you can get with your gift and its delivery, the bigger the payoff. Who: A boy or girl you fancy who fancies you back. The idea here is “I’m thinking about you, exclusive romantic partner, see you later, smiley face” rather than “Hi, I’m first name-last name, I’ve seen you around campus and am thinking about you, where you live and when you have class.” The latter can be a little creepy (or a lot creepy). What: Most commonly, non-perishable sweets: cookies, cakes, muffins and brownies. Classic chocolate chip cookies or brownies are good if you’ve yet to discover if your partner likes lemon, coconut, peanut butter and so forth. Besides nut and gluten allergies, baked goods tend to be a safe bet. There’s also something inherently personal and comforting about someone’s favorite sandwich. Keep an ear out for clues, quietly take note, then BAM leap into action with the best version of this sandwich ever imaginable, maybe spring for high quality cheese or a baguette instead of plain old white bread. Sandwich=thoughtful, in my book. Or, if you know your partner dreads ahem “making” ahem “dinner” (can of tuna or pasta with butter) or resents the dining hall more than most people, hide a fully prepared meal in their mini-fridge to elicit a resounding “heck yes!” Try this microwave lasagna or this ramen noodle extravaganza. Where: Dorm, class, work… Wherever they could be that you can’t be. I really like the “drop-off” method because it’s a reminder of you without you being there, so it’s kind of a unique in-between type thing, like a text, but tasty and tangible. Again, let’s not violate any privacy or try this on someone with whom we’ve yet to build mutual trust. Sneaky surprises too often lose some of their charm and can rob people of their rightful space. Be normal. 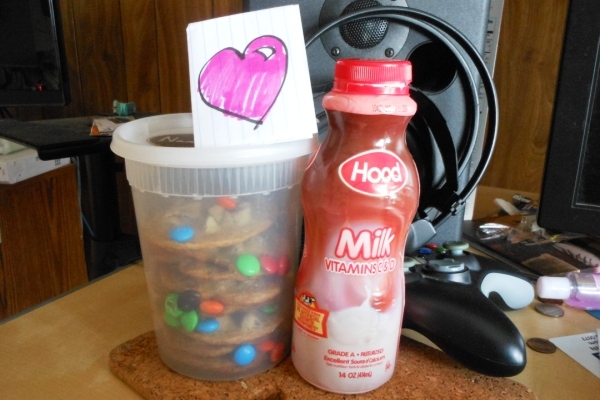 Why: “Sympathy” snacks for their favorite player getting traded or “congratulations” cookies for beating a new video game are more fun than any old “hi.” Shows you’re paying attention, which you are, to things that are fun and trivial but still important to them. Google. My boyfriend is a *former* World of Warcraft player, and I Googled all this Horde and Alliance nonsense to demonstrate my caring with humorous notes to go with surprise quesadillas and such. How: Text or Facebook message his roommate to find a time when he can let you into the room but your boyfriend won’t be there. If possible, drop it off with someone at his workplace before he arrive. Show up outside his class a few minutes before it ends. See all the trouble you went through? It’s just a wow-factor. If you’re leaving something in the fridge, leave a note on his computer or iPod with a clever hint, or an arrow—how mysterious! What’s in the fridge? Something awesome from someone who loves you! What could be better than that? Make me proud! What a great post. ( You’ve inspired me to melt down my leftover Starburst as I write this.) Now, what to do with the leftover Snickers pancakes?